In Delhi-NCR people see sort of a pattern of severe pollution every year in Winters, This situation usually starts in Diwali festival and gets more bad afterwards, causing harmful effects to majority of lifes. After observing the success of the World’s Largest Air Purifier tower in Xi’an, China which could clean 10 million cubic metres of air daily. which leads to the cleaning of 32 million cubic meters of air each day. The plan further states the Air Purifier tower will be 40 feet tall and 20 feet wide. 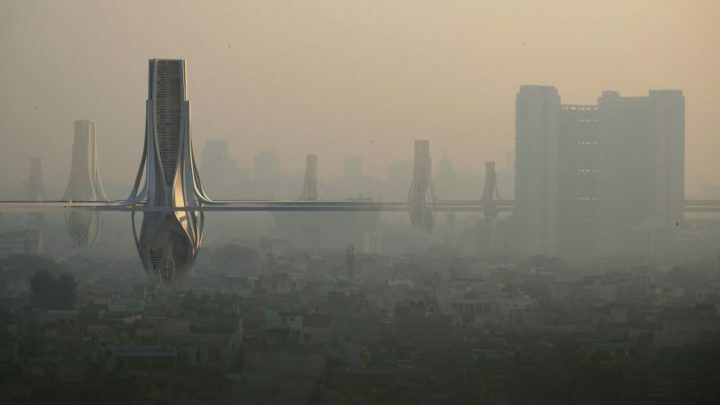 Its Co-founder Pavneet Singh Puri told PTI the tower will provide clean air for 75,000 people living in the three-kilometre radius around it. The Startup is Delhi based and has recently got the patent for the “world’s largest as well as the strongest air purifier” by the World Intellectual Property Organization. The purifier will be using the H14 grade highly effective particulate arrestance (HEPA) filters, these are the filters used in severe conditions. It can clean up to 99.99 per cent of the particulate matter (PM) present in the air with the help of pre-filter and activated carbon. Just like normal air purifier the pre-filter will catch PM10 and larger pollutants, while the HEPA filter will catch PM2.5 particles. It will include 48 fans which will be electrically powered by solar panels, the fans will pull polluted air and simultaneously push out the clean air. This Air purifier will also be called as City Cleaner, the company says the air purifier tower project can be completed within four months once it receives the permission to proceed from the authorities. The cost expected to be 1.75 crores to 2 crores per tower. Puri told PTI, Our product will clean air three times of what China Air Purifier cleans. We are filled with gratitude and looking for the success of this very Indian Plan, it will definitely improve the air quality leading to the more saver environment. Stay tuned with Alloftop for more!